It is of both historical and architectural interest, in a significantly eclectic way. The site of La Mezquita originally bore a church. Then, after the Moors conquered Cordoba in the 8th century, they demolished the church and built the Mezquita (mosque). Five centuries later, the Christians regained ownership. 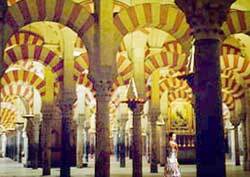 The Mezquita of Cordoba was enlarged and enhanced into a vast, magnificent house of worship. The Moors creatively used a variety of architectural styles including Persian, Mid Eastern Islamic, Roman and Gothic that together helped define Moorish architecture. One of the most striking design elements of La Mezquita is the double-tiered "candy stripe" arches supported by sculptured pillars (see photo). The Christians rewon Cordoba in the 13th century and promptly consecrated the edifice as a church but left much of the superb Moor-erected architecture intact. Their major alteration was building a cathedral within the mammoth mosque. The building is peacefully divided between Muslims and Catholics (who use the bizarrely situated cathedral).